These soft blueberry rolls are easy to mix and knead using the bread machine, and they make a fabulous breakfast or brunch bread. Shaping the rolls is a snap. Just roll the dough into balls and place them in the pan, side-by-side. They're wonderful with the icing, and one person suggested the egg wash and a sprinkling of cinnamon-sugar. 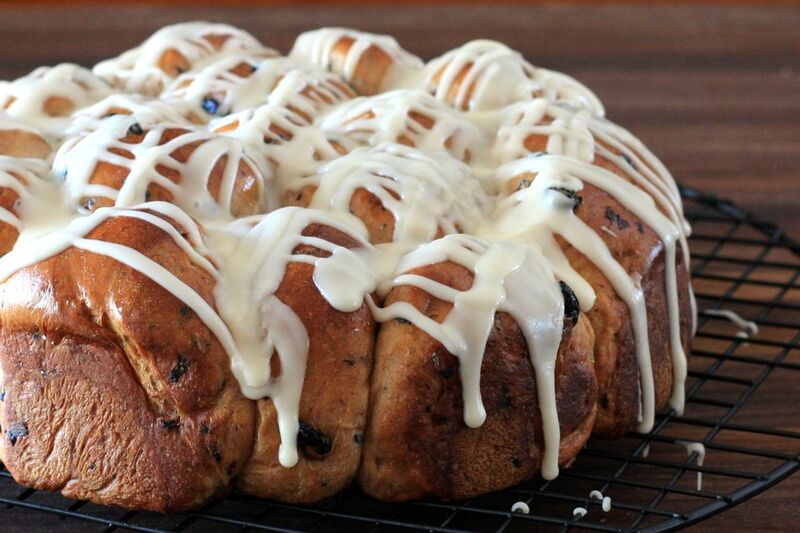 Take a pan of these pull-apart blueberry rolls to the office or potluck. In a bowl, whisk the milk with the egg and vanilla extract. To the bread machine pan in the order suggested by your machine's manufacturer, add the milk mixture, flour, sugar, salt, butter, and yeast. Start the machine on the dough cycle. Add the blueberries and ground cinnamon at the beep. Grease a 9-inch round baking pan. Turn the dough out onto a floured surface and punch it down. Knead a few times, adding a bit more flour, if needed, to keep it from sticking to the surface and hands. Shape the dough into 16 uniform balls and place them side-by-side in the prepared round pan. Cover the pan with a kitchen towel and let the rolls rise in a draft-free place for 40 minutes. In a small bowl, whisk the water and egg yolk. Brush the mixture over the tops of the rolls. Bake, the rolls for 20 to 25 minutes, or until the tops, are golden brown. Remove the rolls to a rack and let them cool for 5 to 10 minutes while you prepare the icing. In a bowl, combine the confectioners' sugar with the melted butter and 1 teaspoon of vanilla extract. Add 2 tablespoons of hot water or milk, or enough to make a good drizzling consistency. Transfer the rolls from the pan to a rack. Place a sheet of foil or wax paper under the rack. Drizzle the icing over the warm rolls. Cream Cheese Icing: In a bowl, combine 3 ounces of softened cream cheese with 1 1/2 cups of confectioners' sugar, 2 teaspoons of softened butter, and enough milk or half-and-half to make a good consistency for drizzling over the warm rolls. Replace the dried blueberries with dried cranberries or raisins.